Below you can find documentation about the database structure and GraphQL. An overview of the database schema is given in the figure below. 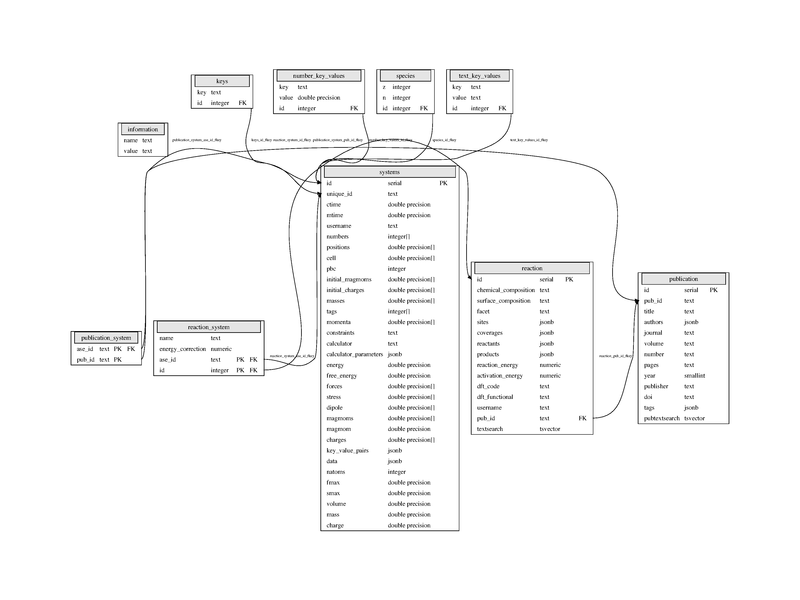 The database structure builds upon the ASE-database (https://wiki.fysik.dtu.dk/ase/ase/db/db.html ) that uses the tables: systems , species , keys , text_key_values , number_key_values , information . These are used for storing atomic structures and calculational information. On top is the tables reaction and publication which are used to store reaction energies and publication info for CatApp v2.0. The tables reaction_system and publication_system links the ASE and CatApp parts together. Go to the backend interface at http://api.catalysis-hub.org/graphql to start using our graphQL browser. And type command + return to see the result on the right hand. This should return the id of the first two reactions in the database. Notice that the left hand side is updated as well. See the tutorials at http://catalysis-hub.readthedocs.io/en/latest/tutorials to learn more. Previous: Welcome to catalysis-hub.org’s documentation!